Last night I watched The Bookthief. 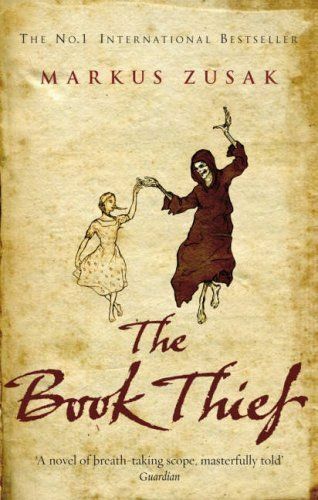 For those of you who haven’t read The Bookthief by Markus Zusak, you’re missing out!! This book is a piece of art..
One of the perfect things about this book is that it is narrated by Death. You might wonder how that is perfect but it just is, no one could tell this story better than Death himself. What is the story about? I’ll tell you. It’s about a girl named Liesel and her brother who have to go live with strangers because their mother is a communist. You see, it all takes place in Germany, in a small town next to Munich, during the Second World War. Liesel can’t read when she arrives at the HimmelStrasse so her new papa teaches her. She has her own dictionary in the basement and more and more books start coming her way. There is also Rudy, the boy with the yellow hair and Max, the jew who shares her love for reading. This book is both sad and happy at the same time, but beautiful even in its sadness. Of all the people I’ve recommended it to, no one ever said that they were disappointed, they all loved it.. So do I and I’m sure you will love it too. P.S. The pictures used are linked on my Pinterest.